Colour me red is what came to my mind after I finished off plating up this recipe to click my final pictures for the blog. Well now if it sounds like any indication to romance then I am afraid you’re up for some disappointment, as the phrase is merely a reflection of how my plate looked, an artist’s palette full of swathes of different shades of red ran through my eyes. Wait a minute, seems I almost forgot to talk about my recipe, which as a matter of fact was too simple to deserve a comparison of a magnitude as that of an artist’s work. But “mind” you know simply goes haywire at times, at least mine does more often than I would want it to. And now, like real now, simply seems to be one of those times, I am thinking about too many things all at the same time. See, I am again not talking about my recipe; guess the best I can do today is only objectively describe it. 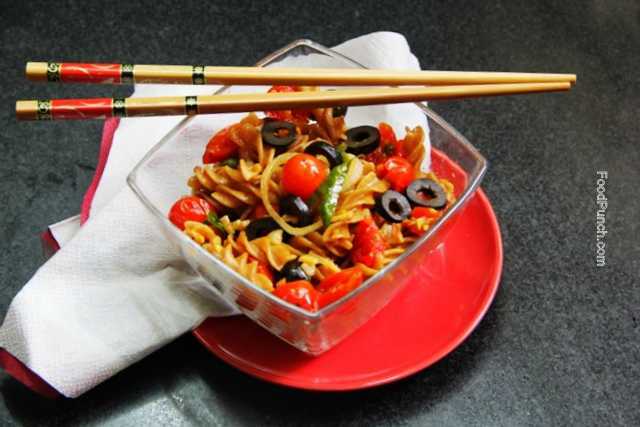 So it was the healthy Whole-wheat tomato flavored Fusilli I got from FabIndia , enhanced its tomato flavours by adding a whole lot of fresh juicy cherry tomatoes along with garlic, some onion rings, a good dash of olive oil , hot green chilli and black olives. All these ingredients went through toss toss in quick succession and I had a delicious bowl full of pasta to dig in. Trust I’ve already expressed my love for eating meals out of bowl, wonder if there are any of you who share my love for eating out of bowls over plates; it’s so much more homelier. 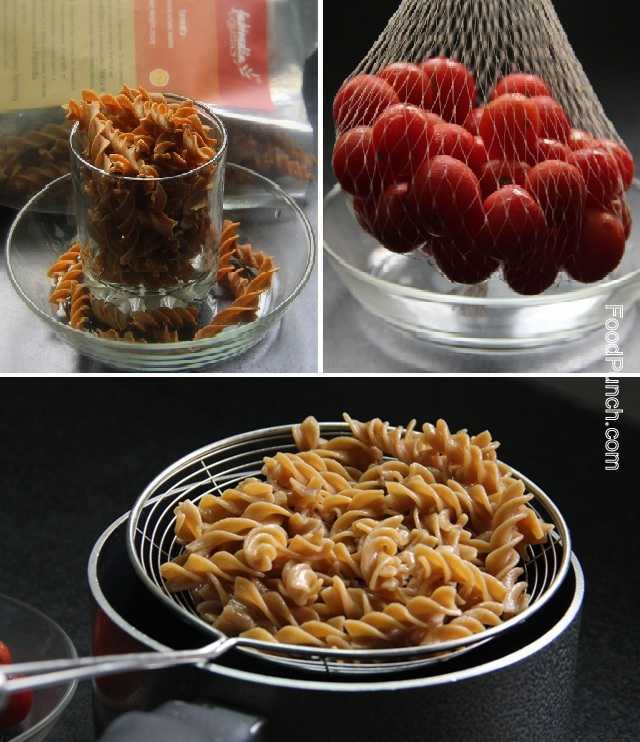 Boil about 1 ltr water and cook the pasta with a little salt for 5-7 minutes, till al dente. Strain and toss with a few drops of olive oil and keep aside. In a frying pan heat the olive oil, add garlic and let it sizzle away. Then add green chillies and onion rings, give a toss. 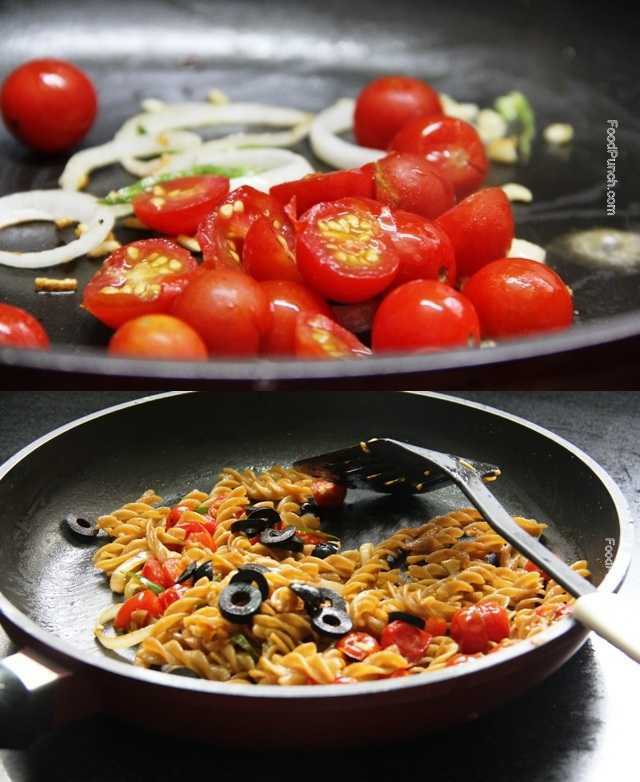 Cut half of the cherry tomatoes into half and add them to the frying pan along with the whole cherry tomatoes. Toss for a minute and add ½ cup of water. Sprinkle salt to taste and cook on high heat for a minute till the water turns into a little thick sauce with the juices to cut tomatoes. Do not overcook or reduce, it should take not more than a minute. Add the cooked fusilli and toss everything together. 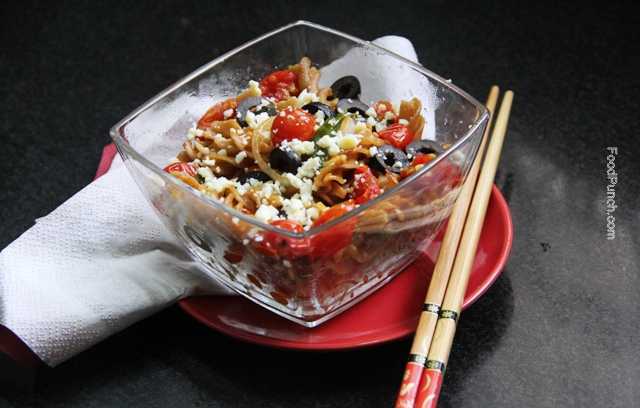 Turn off the heat and dress up with some pepper, add the cut olives. Top up with some grated parmesan and enjoy a bowl full of goodness. Seriously I’ve got nothing here. Just the wheat pasta cooked faster than the regular flour pasta. Also the wheat pasta unlike the regular one did not double up in quantity on cookining. My 1 & ½ cup must have turned to just two cups full on cooking.